Well, it’s been an unfunny week for funny writers. 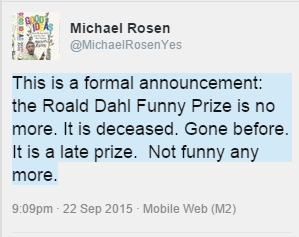 I was sad to see this tweet from Michael Rosen on Tuesday. I had thought the Roald Dahl Funny Prize was on a break, ready to return in 2016 as part of the Roald Dahl centenary celebrations, bigger and better than ever. But now it seems that won’t happen. My kids and I have found some of our favourite authors on Roald Dahl Funny Prize shortlists – Frank Cottrell Boyce, Andy Stanton, Philip Ardagh, Louise Rennison, Anthony McGowan, Jo Nadin, Philip Reeve, Josh Lacey, Jim Smith and Holly Smale, to name but a (brilliant) few. Finally, I’m a huge fan of Roald Dahl’s work (Matilda and The Witches are among my favourite books ever written) – I love the madness, the mischief, the eccentricity, the darkness, the sense of fair play, the ability to make the ordinary extraordinary, and all the other intangible things that keep these books at the top of the bestseller lists. This prize always seemed like something he’d have liked. But, sadly, it is no more. She wasn’t the only author to feel this way. 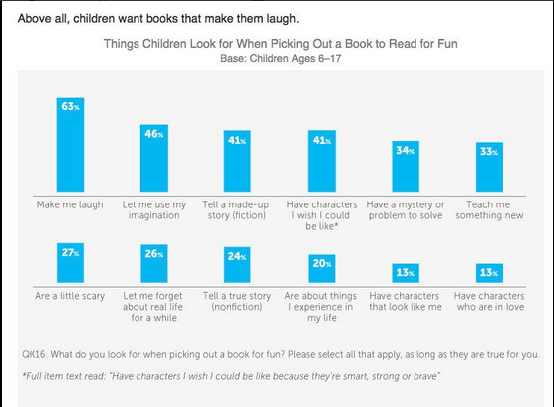 A twitter-load of writers and illustrators joined a battle cry to find a new sponsor, and Jonathan Emmett shared a chart from Scholastic’s fifth “Kids & Family Reading Report” to demonstrate how important humour is when kids are choosing books to read. The timing of the announcement bothered me too. I’ve started to feel like the world is losing its sense of humour. The images on the news make you want to cry rather than laugh, and it’s getting harder and harder to see the funny side of world events (with a few notable recent exceptions involving people in high places that are perhaps best not referred to here). This is exactly the time we need to be celebrating funny books and funny writers. The books (and people) that make us laugh most are often those full of hilariously subversive ideas, which can help us make sense of our increasingly nonsensical world. And if they can’t help us make sense of things, they can at least help us laugh at them. Only last week I posted a blog about how much I love silliness and laughter. In it, I explained how chats I’ve had with young readers at book events, and over email, have shown me how important humour is to them. I’ve heard brilliant tales about how losing themselves in funny books helps kids muddle through otherwise miserable days, reminding me of times when it did the same for me. Perhaps ironically, in that blog, I said I was thrilled people were increasingly recognising that books don’t have to be worthy to be worthwhile. ‘Reading for Pleasure’ was introduced to the UK curriculum in 2014 and, as I said in my post, if I were choosing a book to read for pleasure, nine times out of ten I’d choose a funny book. Maybe that tenth time I’d choose a serious literary tome, but probably only if someone was watching! Funny books are A GOOD THING. So I’m thrilled so many of my favourite writers and illustrators have voiced their disappointment that the prize is no more, and I hope that soon, perhaps even by the time you read this, they’ll have found a new sponsor and the prize will have been resurrected. I’m also excited to hear that Michael Rosen is currently investigating the possibility of an annual ‘Funny Books Event’. Fingers and funny bones crossed. That would be a great thing to come out of this. Louise Rennison taps into that never-ending fountain of teenage mirth, misery and awkwardness that Sue Townsend identified decades earlier with The Secret Diary of Adrian Mole 13¾. Angus, Thongs and Full Frontal Snogging is probably her best known book, in which Georgia’s dilemmas include how to replace accidentally shaved-off eyebrows; how to cope with Angus, her small labrador-sized Scottish wildcat; her first kiss with Peter – afterwards known as Whelk Boy; and the fact that she went to a party dressed as a stuffed olive. If slapstick humour is your thing then this is perfect. The truly tea-spitting guffaw came, for me, during the ‘T-Rex hands’ scene in Model Misfit. The ‘second-rate dinosaur’ comparisons are comedy gold, and I frequently find myself making little involuntary clawing movements at my family as a result. The Bubble Wrap Boy is the brilliant tale of clumsy, klutzy Charlie Han (‘Tiny Charlie from the Chinese chippy) and his quest to find the special something that will turn him ‘from an ewok to . . . I don’t know, Yoda?’ Charlie’s thing turns out to be an extraordinary talent for skateboarding, which is an unfortunate coincidence, given his overprotective mother’s paranoia about risk. I loved the exchanges between mother and son. “Imagine Shawshank with shoutier guards,” he declares. The Bubble Wrap Boy is a brilliant book that uses the lightest touch to get you thinking about deeply important subjects, leaving you happy but slightly soggy around the eyes. Me too, Tamsin. Fingers crossed Michael Rosen can set something up! I SO agree with you, Rachel! I love writers like Louise Rennison, and I’d also mention some brilliant funny books for younger readers – Anne Fine’s Killer Cat books, Eoin Colfer’s Spud Murphy, classics like Judy Blume’s Fudge books or going back still further, the Jennings books by Antony Buckeridge. These are the books I turn to for entertainment and consolation when skies are grey. 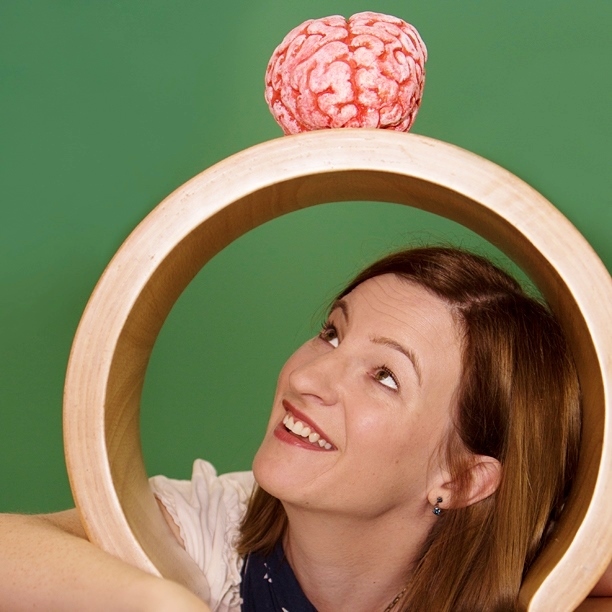 Why do people underestimate the craft involved in writing a funny book and the joy it brings? Many of these books are showing it’s OK to slip up sometimes, everyone makes mistakes, you’re not alone in feeling a doofus – what better or more important message for children setting out to face life’s challenges? I write lots of humour and it is the BEST feeling in the world when I read an extract to an assembly full of giggling, chortling children. And how better to make the point that reading brings pleasure? Thanks for the tips for younger readers. I love Anne Fine, Eoin Colfer and Judy Blume – I’ll have to look at the Jennings books. Sometimes capitals are important to make your point! FUNNY BOOKS RULE! Hear hear to all of the above, and the day a funny book wins the Carnegie can’t come soon enough for me! Yes, yes and yes again. My daughter became a reader the day she picked up Andy Stanton and it was cemented the day she picked Liz Pichon. Both happen to be Dahl Funny Prize winners. The prize seemed something Dahl would have loved – it’s a shame Kelly can’t see that. Is it not possible to launch a book in the US and continue the prize? ?